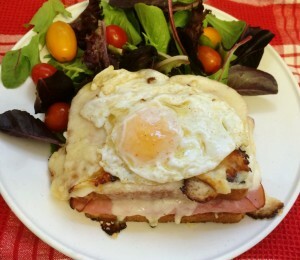 This variation on the classic Croque Monsieur is a wonderful brunch sandwich. I have simplified it a bit to make it easier to cook for your hungry family. Served with home fries of a light salad and you have a meal fit for the Madame of the house! Pro Tips: You can make the Mornay Sauce the night before. It’s easier to scoop and spread when chilled. First thing in the morning, prep the sandwiches on a cookie sheet to save yourself some time, then all you need to do is broil them and fry eggs at brunch time. This recipe makes 2 sandwiches, but it multiplies easily to feed a crowd. In a saucepan, melt the butter. Add the flour to the butter and whsk well to make a roux. Cook for a couple of minutes at medium heat to cook out any floury taste, but do not brown. Whisk in the milk and continue cooking until the sauce can coat the back of a wooden spoon. Season with salt and nutmeg. Remove from heat, and whisk in the cheese. Cool the mixture and keep in the refrigerator over night. On a baking sheet, lay 2 of the slices of bread and spread a thin layer of the mustard. On each slice of bread with 1.5 ounces of the ham, 1/4 cup of the mornay sauce, and 1 ounce of the grated cheese. Top each sandwich with the remaining slice of bread and then 1/4 of mornay sauce. Broil the sandwiches until they are golden brown and delicious. This a super omelet with an easy “make ahead” filling. The avocado adds the lush richness of a hollandaise sauce without the trauma of trying to make it. Pro tips: Remember, asparagus is a basically a flower. The tightest and most closed spears are the freshest. The night before, blanch the asparagus in salted water and drop into ice water bath to stop the cooking. Drain and store in the fridge. Blanch the shrimp until they just turn pink in a mix of water, white wine, a couple lemon slices, and salt and pepper. Drop them in an ice water bath to stop the cooking and store in the fridge. The next day, in a pan with butter, heat up the shrimp and asparagus. Season with salt and pepper. Whisk 3 eggs in a bowl with a tablespoon of water to keep them loose. Heat a sauté or omelet pan on medium, and add a pat of butter to the pan. When the butter is melted and foamy, add the eggs. Keep them moving in the pan to create a nice round base. To the side of the pan opposite from the handle, add your filling. Hold the handle firmly and tip the omelet onto the plate flipping the empty half over the filling. 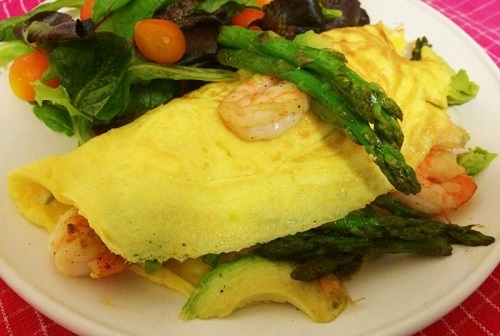 Garnish the top of the omelet with a shrimp, slice of avocado, and an asparagus spear. 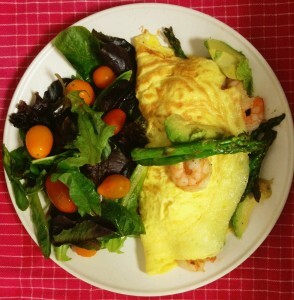 This is also a great dinner omelet! Food & Wine: Fish Fridays! Previous PostQ&A: What are TartratesNext PostHappy Moscato Day!